Add whimsy to a simple and heartfelt expression on kitchen linen, chef coats, apron, hats and more. 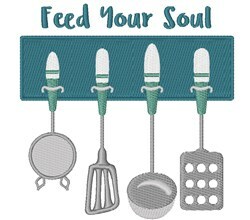 Hopscotch is happy to present Feed Your Soul machine embroidery design which has 16309 stitches and is [102.38 mm x 103.80 mm] large. If you would like to view more embroidery patterns please search on our embroidery designs page.